Web pages are text or ASCII files in which HTML, Hypertext Markup Language, is used to specify the format of the Web page, images to be displayed, hyperlinks, and possibly other elements. A Web browser interprets the HTML in the file, called the source file, and then displays the Web page. So one part of the task of writing Web pages is learning how to use HTML to design and implement appropriate and effective pages. It appears that <A HREF="http://www.mwc.edu/ernie/index.html"> Ernest Ackermann</A> is the culprit! It appears that Ernest Ackermann is the culprit! 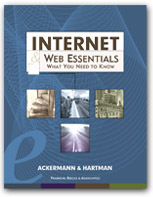 Clicking, in the Web page, on Ernest Ackermann would cause the browser to open the location associated with http://www.mwc.edu/ernie/index.html. Images are put into Web pages using a tag of the form <IMG SRC="URL"> where the URL of an image is put in for URL. The image needs to be either in GIF or JPEG format to be displayed by the Web browser. Text can be aligned with an image, either at the top, middle, or bottom. Images can be placed to the left or right of text. HTML does have lots of other tags; weve covered the basic ones in this chapter. Since a source file is in text format, it can be created with any editor or word-processing program that allows you to save a file in text or ASCII form. No special program to create a Web page is necessary, but when theres lots to do or you have to convert from another format to a Web document, its useful to have a program designed to create Web pages. Some are available as shareware, some as freeware, and some must be purchased before using them. Learning HTML is one part of being able to create interesting and effective Web pages. You also need to be concerned with the content and the layout of the content. Designing, creating, or writing a Web page is generally very satisfying. You create something and then let people around the world see it. Before making the page available to the world, you can develop it on your computer and view it with your Web browser. When you need help or want to pursue the topic further there are a number of resources, guides, newsgroups, and mailing lists on the Web to give help in creating or authoring Web pages. What fun! Listings in directories, discussion groups, newsgroups, tutorials and guides to help you create Web pages. Collections of personal Web pages, articles on the reasons people create personal Web pages. Sources for free images and graphics you can use with your Web pages. Links to tables that show you how to represent special characters such as punctuation, letters with accents, Greek letters, and so on. Information about representing colors in HTML.